A few weeks ago, we met with Powell's Repair Technician, Rachel Baker, to help explain why repairs take more than a day (follow this link to read the previous post). 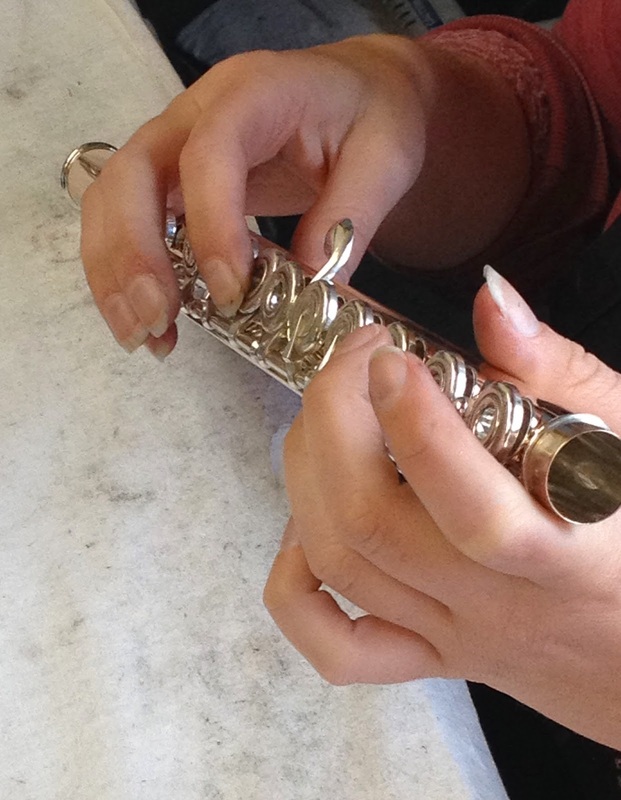 She mentioned that things need to "settle," and when the flute is done changing, it's ready to go back to its owner. Settling -- hmmm.... We were curious about which parts of the flute need to settle after repair, so we asked! Rachel told us that every layer you add to the flute needs to settle. This mainly refers to pads and key adjustments. Both the pads and the adjustments are made with natural materials that will compress as the flute is played. The pads have a natural skin covering, and the adjustments are either paper or cork. These natural materials compress from the light pressure of your fingers closing the keys (which then presses the pad onto the edge of the tone hole) and the motion of the keys working together. We also appreciated Rachel's metaphor for understanding the "settling" process. She summed it up nicely by saying, "Pads take a while to find their home." So, whether a pad is replaced and shimmed or an existing pad is shimmed, it takes a while for the pad to settle once it is positioned back into its home -- the key cup! And as for the adjustments, they need time to work with the keys in the mechanism. Once the pads and adjustments are done compressing and "settled to where they are going to stay," the flute is ready! Rachel said that at this point, everything will stay stable for about a year, depending on how much you play (could be longer if you don't play much or shorter if you're doing a lot of playing). Then, it will be time to send in your flute for a C.O.A., and your flute will once again be settled in nicely before it comes back to you!